Prosecco has enjoyed a boom worldwide, notably in the US and Germany. This sparkling wine with its roots in a region north of Venice has become very popular on both sides of the Atlantic. But the expanding consumption of Prosecco has encouraged the production of Prosecco not only in its traditional home in northern Itlay, but also elsewhere in Italy and even outside of Italy, such as in Brazil. The reason for this expansion is that Prosecco is not only the name of a region, like Napa Valley, but also the name of a grape, like Merlot. As a consequence anyone can use the name of the Prosecco grape, as long as the Prosecco grape is in the bottle. 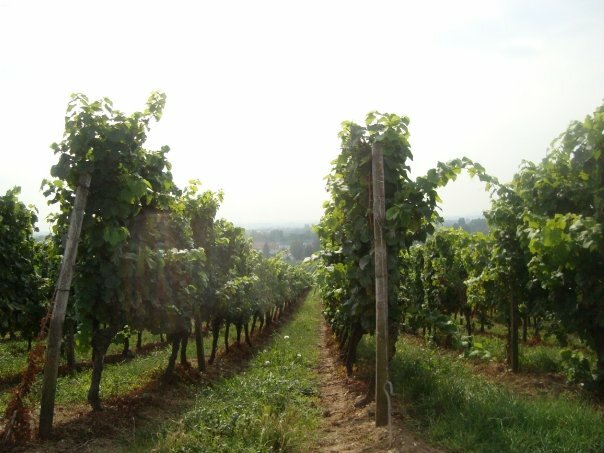 Thus, other regions have tried to participate in the Prosecco boom and have started to produce a Prosecco with the Prosecco grape outside of its traditional home. The boom went so far that Prosecco started to be sold in cans at rock-bottom prices. All this will change in the future, hopefully. Back to the roots. At least in Italy and in the EU, which will probably follow Italy. As of the 2009 vintage, the Prosecco grape has been renamed. Its new name is Glera. From now on, a wine producer in Sicily, for example, can no longer sell the Prosecco/Glera grape under the Prosecco name. Secondly, the heartland of the Prosecco has been upgraded to DOCG status and the larger Prosecco region to DOC status. Thus, Prosecco has become a regional application, just as Champagne in neighboring France. Only wine produced in the official Prosecco production zone can be labeled as Prosecco. The sale of Prosecco in cans has been banned. Most likely the wine makers in Italy and in Europe in general will adhere to the severely tightened rules. For other countries, I would guess it will take some time until the EU Commission will also have negotiated deals with other countries that would prevent them from selling Prosecco. So, for the consumer, if you want authentic Prosecco you have to make sure that it is a DOC or even better a DOCG from Italy. Prosecco will continue to come in three categories. First, there has always been a still Prosecco wine, as there is a still Champagne, although not available on neither the American nor the German market. Second, there is a fully sparkling Prosecco (spumante). It is produced using the Charmat method. The second fermentation does not take place in the bottle, as is the case with champagne. Champagne re-ferments in bottles, which is labor-intensive and expensive. Prosecco, like many other sparkling wines, re-ferments in large tanks, a process that keeps prices down. Third, in between there is the lightly sparkling Prosecco frizzante. It is produced using a process of carbon injection (or carbonation). This does not involve initiating a secondary fermentation but rather injecting carbon dioxide gas directly into the wine. This method produces large bubbles that quickly dissipates and is generally only used in the cheapest sparkling wines. Fully sparkling wines, such as Champagne, are generally sold with 5 to 6 atmospheres of pressure in the bottle. EU regulations define a sparkling wine as any wine with an excess of 3 atmospheres in pressure. These include German Sekt, Spanish Espumoso, Italian Spumante and French Cremant or Mousseux wines. Semi-sparkling wines are defined as those with between 1 and 2.5 atmospheres of pressures and include German spritzig, Italian frizzante and French petillant wines. Finally, the Bellini, the long drink cocktail that originated in Harry’s Bar in Venice, is a mixture of Prosecco and peach puree. Today, it is popular also at the bar’s New York counterpart. Lufthansa serves 5 excellent wines in business class and one has ample time to taste all of them. It is a very good selection of both old and new World wines. Champagne Jacquart Brut Mosaique. This is a cuvee of Pinot Noir, Chardonnay and Pinot Meunier. An excellent champagne. Maturation on the fine lees after second fermentation. Intense straw-yellow color, yeasty aromas and fruity notes of pear and apple. On the palate, the wine is very refreshing with pleasant mousse. 2008 Sonnenwind, Riesling Spaetlese trocken, Weingut Motzenbaecker, Germany. Motzenbaecker is one of the wine estates of Gina and Klaus Menger-Krug, who met at collage and now own several wine estates in different wine regions. They are also known for producing one of the best German sparkling wines. This was a dry Spaetlese with a bouquet reminiscent of ripe apricots, juicy peaches and ripe citrus fruit, which flatters the palate with freshness and finesse. 2007 Columbia Valley Chardonnay, Red Diamond, USA. The wine region of Washington State north of Oregon has scored a huge upswing in the wine world in recent years. This is a chardonnay in classic New World style, with pleasing aromas of ripe citrus fruit, juicy pineapple and subtle hints of vanilla. 2005 Chateau Barreyres, Haut Medoc, Cru Bourgeois, France. A classic elegant Cru Bourgeois with subtle spiciness, cassis fruit and elegant toasty notes. A classical Haut Medoc in the traditional style. 2006 Quinta do Gradi, Vinho Regional Estremadura, Portugal. A juicy wine crafted in the New World style. The bouquet is appealing with well-integrated oak spiciness, a little cinnamon and clove, as well as dark berry fruits. It has a touch of chocolate on the palate and well-knit tannins and a good structure on the finish. A wine from an upcoming region in Portugal that is turning to New World style techniques. A finished the dinner with a Schladerer Kirschwasser, a very nice German brandy which is made on the basis of cherry. I had a lot of fun at the Rheingau Festival in Frankfurt (see my Blog posting of September 2, 2009). There were perhaps 2 dozen booths with winemakers from the whole Rheingau area. I focused on Weingut J. Schaefer from Hochheim. The senior boss Willi-Josef was there until 16:00; for the rest of the day until mid-night it was his son Josef with his lovely wife, who has been managing the winery now for several decades. This is a family-owned and -operated winery with about 7 hectares of land. There were 14 wines to choose from, of which 12 were dry and only 2 were sweet. Although from the other side of the Atlantic ocean, you get a different impression, but the Germans predominantly drink dry wine. 11 wines were white and mostly Riesling and 3 wines were red, all Pinot Noir. Pinot Noir is coming up in Germany as we all know. Schaefer wines, though dry, are allways at the legal limit of dryness. You never find bone-dry wines here, but wines with a nice balance between acidity and sweetness. All wines had screwcaps. Josef Schaefer told me that he has moved over to this concept completely. I noticed that other winemakers use shrewcaps only for the lower quality wines but Schaefer does it for his whole range. 2008 Hochheimer Kirchenstueck, Riesling Spaetlese trocken, a dry Spaetlese with a lot of tropical fruits on the palate and a nice long finish. 2008 Gewuerztraminer Spaetlese trocken; also a dry Spaetlese, but a Gewuerztraminer, which is unusual for the Riesling dominated Rheingau: nice wine with lots of tropical fruit, in particular pineapple. 2008 Hochheimer Hoelle, Riesling, Erstes Gewaechs; this was a powerhouse. At first, crunchy green apples dominate the nose. As the wine blossoms in the glass, wet slate and Asian pear emerge. On the palate, the wine is crisp and full bodied, with underlying slate minerality, and a slight hint of sweetness in tension with firm, crisp acidity. Nice, long finish. Josef Schaefer explained to me that this wine was his first Erstes Gewaechs. As described in my posting of September 28, 2009, Erstes Gewaechs is part of a new classification that was introduced in Germany a few years ago, pushed by the VDP. In short, all vineyards have been classified along the French terroir way and the top vineyards have been identified as Erste Lage. Schaefer owns Erste Lage vineyards. Subject to a number of quality criteria, an Erste Lage wine can be awarded the Grosses/Erstes Gewaechs label. Erstes/Grosses Gewaechs wines are always dry, although they have to be at least at Spaetlese level in terms of ripeness of the grapes at harvest. This one was at Auslese level. Surprisingly, all Erstes/Grosses Gewaechs wines are sold as a QbA. 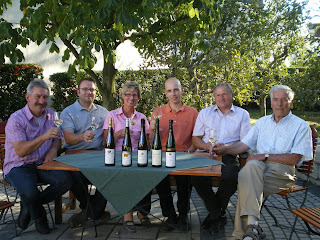 Picture: Producers of Erstes Gewaechs Wines in Hochheim from left to right: Josef Schaefer, Thorsten Dienst (Dorotheenhof), Pia Rosenkranz (Rebenhof), Verkaufsleiter Weingut Kuenstler, Emmerich Himmel, Franz Werner Michel (Domdechant Werner)--- Photo from Luettges. In a Blog posting of September 27, 2009, I reviewed the new concepts of Erste Lage, Erstes Gewaechs and Grosses Gewaechs that wine lovers will find more and more on the labels of German wines. In another posting, I discussed the 2007 Grosses/Erstes Gewaechs Wines of the VDP wine estates that were presented to the General Public in Wiesbaden a couple of weekends ago. But not only VDP wine estates can produce these top wines. All wine estates can do this as long as they own a vineyard that has been classified as Erste Lage. As far as the Rheingau is concerned, the Rheingau Winemaker Association presented their Erstes Gewaechs wines at the same time. Remember, Erstes Gewaechs wines are in terms of sugar level at harvest at least at the Spaetlese level, but always dry, and the grapes are grown on exceptional (Erste Lage) soil. The prices for these wines range between 12,00 € and 36,50 € for Riesling wines ex winery and between 22,50 € und 42.20 € for the Spaetburgunder. You find a nice write-up by the Secretary of the Weinfreundeskreis Hochheim, J. Luettges, about this event in the Hochheimer Zeitung, but they charge for it. You can also get a copy from Mr. Luettges through me, I guess. The WSJ wine couple Dorothy J. Gaiter and John Brecher reviewed American, in particular Californian, Chardonnays a few weeks ago and I reported on it on my posting of September 27, 2009. Their review was devastating; they were "angry after our tasting of Chardonnay, because we found too many of those wines stupid and insulting—bad, thoughtless wines made for profit, not passion". Last week, they gave us their impressions on Cabernet Sauvignon from California. This time, their review was more upbeat, but still disappointing. They found some values, but many wines were just "okay". The wines were technically fine and Dorothy and John were pleased with the fruit and minerality of many of the wines, but they were in their judgment not, overall, exciting. What they lacked was that amazing combination of focus, structure and balance that makes Cabernet great. Overall, they felt that they tasted too few Cabernets that would move them to gush, "Wow, if we paid $70 for this, we'd be happy because it's special and worth every penny." But there were a handful. One of the best of tasting, Antica, is owned by Italy's Antinori family. The winery made about 2,000 cases, which were distributed nationwide. Our other favorite, Duckhorn, is made in relatively large quantities: 11,782 cases, which were distributed nationwide. Both of these wines had them talking all night about their complexity, from hints of black olives on the nose to blackberries and earth on the finish. That's what fine Cabernet should do. Read the whole article, which is, as usual, very entertaining or watch the video here. I have not seen this in the Washington area, but in the Frankfurt area it is now widely available: Federweisser. This is grape must, which is in the process of fermenting. Typically, when you buy it, it is at the early stage of fermentation. It has 4% of alcohol or a bit more and tastes like fizzy lemonade. Over time, as it continues to ferment,the sweetness goes away. This process continues until an alcohol content of about 13 percent has been reached. The Federweisser assumes a dry and often bitter taste at this stage. It is become badly made wine. Federweisser is available in Germany from early September to late October, and is generally served together with hearty, savory food. The classic combination is Federweisser and Zwiebelkuchen (onion tart). Two final points: As the fermentation of the Federweisser continues in your stomach, it is advisable to limit consumption to a glass or two at the most. My mother can tell you a painful story about disregarding this. Federweisser has nothing to do with Beaujolais Nouveau, which is finished wine that however has not benefited from any or very little aging and is sold starting the third Thursday in November of each year. When I am in Berkeley--and as my daughter lives there I am quite often there--one of the things that I do first after arriving is to check in with Kermit Lynch, the wonderful wine merchant on 1605 San Pablo Avenue, just a few blocks down from where my daughter lives, and stock up the wine cellar of my daughter with his wines. 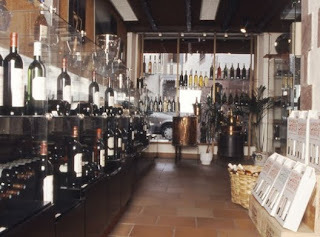 It is an amazing wine store with an outstanding selection of wines, in particular from the South and South West of France. You find wines there that are usually hard to come by in the US. Well, Kermit Lynch owns a vineyard in Gigondas and lives part of the year in Provence. for many years he has been introducing off the beaten track wines to the Berkeley and more generally the American market. 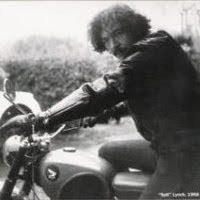 But Kermit Lynch is also a musician since the Berkeley days of the 1960s. Recently he has recorded a new CD. Jancis Robinson has written up a great story about him on her blog. The other place I like very much in Berkeley is Venus, a restaurant on 2327 Shattuck Avenue. This place is amazing. The food is fresh, local, organic, and extremely creative. The food is put together with great care and integrity. Their motto is seasonal--organic--sustainable and what arrives on your table is indeed that. Look out for Katharina, who works there 3 days per week. There are new terms appearing on German wine labels and wine lists: Erstes Gewaechs, Grosses Gewaechs, Erste Lage. This reflects efforts that are under way to supplement or even replace the current wine ranking system. The main reference for wine making in Germany today is the wine law of 1971. At the center of the 1971 wine law is the content of sugar in the grapes at the point of harvest. Accordingly, wines are classified from Tafelwein to Trockenbeerenauslese depending on the sugar content of the grapes at harvest. This, however, does not say anything about how sweet a wine in the glass will be at consumption. Thus, a Spaetlese, for example, can be bone-dry or very sweet, although being made from exactly the same grapes with the same sugar content at harvest. See my blog posting of August 24, 2009 on that. The 1971 wine law also has elements of a terroir concept. There are Grosslagen (collective vineyards) and Einzellagen (single vineyards). For the average consumer, Grosslage sites became virtually indistinguishable from Einzellage (single vineyard) sites. Furthermore, all the single vineyard sites were given equal status and only wine experts know which single vineyards are good and which not so good. Driven by the objective to restore the prestige of Germany’s significant vineyards and to help the consumer in terms of distinguishing dry from sweet wines, the wineries that are members of the Verband der Praedikatsweingueter (VDP) introduced the concepts of Erste Lage, Erstes Gewaechs, Grosses Gewaechs. In a first step, all vineyards were rated and the best parcels of them were identified as Erste Lage (First Site). This took several years. Historically relevant maps were used. After a lengthy process and lots of discussions, the Erste Lage concept was introduced in 2001. In my region, the Rheingau, about 1/3 of the wine growing area comes under the Erste Lage label. Erste Lage vineyards are the top vineyards. Further restrictions apply: there are yield restrictions; only hand picking of grapes is permitted and harvest must be late in the autumn; the sugar content of the grape at harvest must be at least that of a Spaetlese; only certain grape varietals can be planted: Riesling is the only varietal allowed for Erste Lage wines in the Mosel, Nahe, and Mittelrhein, but grapes like Spaetburgunder (Pinot Noir), Lemberger, Fruehburgunder, Weissburgunder (Pinot Blanc), Grauburgunder (Pinot Gris), Gewuerztraminer, and Silvaner are included in other regions. Second, the Grosse Gewaechs and Erste Gewaechs concepts were introduced. These terms basically mean the same thing but for some reasons the latter is used in the Rheingau and the former in all other wine regions. Grosse/Erste Gewaechse wines are always fully fermented and dry. The Grosse/Erste Gewaechs lable is thought to resemble the Grand/Premier Cru designation in neighboring France. Here and there, these wines are dry. Grosse/Erste Gewaechs refers to a top dry wine from a top vineyard. Erste Lage wines that are made in a sweet style continue to carry the traditional Spaetlese, Auslese, Beerenauslese, Trockenbeerenauslese and Eiswein lebels. A dry Auslese is thus a thing of the past, as far as the Erste Lage vineyards are concerned. If the wine has the Auslese level of sugar at harvest, is fully femented and made dry, it will be sold as Grosses/Erstes Gewaechs. 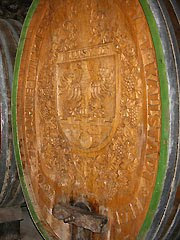 If the same wine is made in a sweet style, it will continue to be marketed as Auslese. In sum: The Erste Lage concept is singling out the top vineyards. If the wine is then a Erstes/Grosses Gewaechs, the consumer can expect a powerful top-quality dry wine than can compete in the international market with other great dry wines. By contrast, Erste Lage wines with the traditional Spaetlese, Auslese, Trockenbeerenauslese and Eiswein labels will be noble-sweet wines, which are typical for Germany and difficult to find elsewhere. Will this help? I doubt it. The new classification covers only 1/3 of wine produced in Germany. The large majority of wine will be produced outside the new rules. I think it has not simplified things, it has complicated it. This was an unusual wine. Bacchus is one of the new breeds of grape varietals that were created in the 1960s and 1970s in Germany; it was released for general cultivation in 1972. Thus, the 1974 we had, was one of the first, if not the first vintage of this wine and the winemaker was probably still experimenting with the new grape. The Bacchus grape is Silvaner crossed with Riesling and this animal again crossed with Mueller-Thurgau. It is a large yielder that tends to produce fruity wines with a distinctive bouquet. It has no high requirements for sites it can be planted and ripens early. 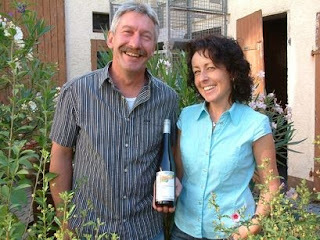 The producer of our wine was the wine-coopeative of Kallstadt/Pflaz. This is an old one, founded in 1902. There are more than 200 wine-cooperatives in Germany currently, which account for about 1/3 of the wine production. The wine did not disappoint us. In fact we were pleasantly surprised. The winemaker has done a good job. The wine was dark-yellow in the glass. Despite the age, there was not even a hint of a sherry tone, but a light tone of honey on the nose. The finish was long, although Bacchus is a grape that is low in acidity. There was still a fair amount of sweetness. As a Kabinett, the wine was not chaptalized so the body came all from the sugar in the grapes at harvest. I guess, the sweetness was produced by adding “Suessreserve” and not stopping the fermentation (see my posting of August 24, 2009). The Bacchus grape hasn’t been a great success story. Since its peak in the 1990s, the grape has been on the decline to the extent that the Winzergenossenschaft Kallstadt, for example, no longer produces Bacchus wines today. Instead, I found on their price list Chardonnay and Sauvignon Blanc wines, which are well known further south in France and which were definitely not in the portfolio of the Winzergenossenschaft when I bought the Bacchus wine about 30 years ago with my wife Annette and my parents. Funny...Dave McIntyre from the Washington Post and Eric Asimow from the New York Times covered the same wine region in their weekly wine column last Wednesday: the South of France. And both came to the same conclusion that the wines there remain stylistically unpredictable. One never knows whether one has a New World-style fruit bomb in the bottle or a lighter wine with a more delicate balance of flavors. I would like to add: the South West of France, with the Cahors (the Malbec has its roots here before it became the signature grape of Argentina), Jurancon, Gaillac, Madiran and--my favorite--tiny Irouleguy (see my wine in the glass column of September 10, 2009). A wine made by a wine-cooperative in the Jurancon, this is an Old World-style wine with a lot of tannin, as the Tannat grape is dominating the cuvee. I bought the wine for Euro 4.60 at Jacques' Weindepot in Frankfurt/Germany. Picture: Christian G.E. Schiller and 6 wine queens. The wine queens of 6 villages of the Rheingau – Hochheim, Eltville, Hattenheim, Kiedrich, Winkel and Geisenheim--were holding court in Hattenheim/Rheingau on April 11, 2009 and I had the pleasure of being in the middle of them. A wine queen is an ambassador of the wine village or the wine region that she is representing of for the whole of Germany. Typically, each German wine village has its own wine queen. One of them is then chosen to represent the wine region. Finally, one of the 13 regional wine queens becomes the German wine queen and represents German wine around the world. The German Wine Institute/Mainz has organized the elections of the German wine queen since 1949. The 13 candidates that make it to the finals tend to be well-educated, articulate (in German and in English) young women able to represent German wines and wine-growers at home and abroad. The current German wine queen is Marlies Dumsky, a charming young lady from the Franken region. She was in New York City earlier this year and did a session with Gary Vaynerchuck. It is episode #711. Looking ahead, the next round of selections is in full swing. As for the Rheingau, the new regional wine queen will be crowned on September 6, 2009 in the castle Johannisberg. There are two candidates. One of them is Isabelle Diefenbach from Hochheim. I hope she will win. Then she would also be a candidate for the national competition which will take place on October 9, 2009. Every other year in Bingen, Germany, the Best of Riesling competition invites a group of internationally recognized experts to choose their favorite Riesling wine. In 2008, more than 50 experts from a dozen countries gathered to assess over 1,800 wines from 10 countries. Prizes were awarded to three groups of wines: German Rieslings, Non-German European Rieslings, and New World Rieslings. German Rieslings. This group was divided into four subgroups: (i) dry (up to 4 grams per liter residual sugar); (ii) off-dry (up to 12 grams); (iii) sweet (from to 12 to 90 grams) and (iv) extra sweet (more than 90 grams). Most of the wines which were awarded prizes were from small and medium-size wineries not well known in the United States. The first prize in the dry category was awarded to the 2007 Hochheimer Kirchenstueck Spaetlese from Weingut Schaefer in the Rheingau. Hochheim is a cute little village close to Frankfurt. You can take the S-Bahn from the Central Railway Station in Frankfurt to Hochheim. Weingut Schaefer is in the center of the village, at Elisabethen Strasse 4. Surprisingly, all three winners in the dry category were Spaetlese. Many wine drinkers believe that German Spaetlese is always sweet,, but this is a misconception. I discussed the question why German Riesling can be sweet in my Blog posting of August 24, 2009. In a country with a cool climate like Germany, sweet wines are sweet because of three reasons: (i) the fog in the vineyard producing the noble rot and botrytised wines, (ii) the frost during the harvest resulting in ice wine or (iii) the skillfull processing of the grapes by the winemaker after the harvest in the wine cellar. Indeed, German wine makers have developed extraordinary skills in arresting the fermentation or blending the dry wine with suessreserve to produce wines that display a combination of a low level of alcohol and delicious sweetness making them unique in the world. All wines in the off-dry and sweet categories were Spaetlese or Auslese wines, with one exception. A Qualitaetswein besonderer Anbaugebiete (QbA) won a medal: 2007 Laubenheimer Vogelsang, QbA, Weingut Carl Adelseck (Nahe). This is a wine that most likely has been chapitalized and stopped and/or enriched through suessreserve. While chapitalization of wines is allowed in neighboring France up to the top categories of wines, in Germany it is only permitted for grapes with a low level of ripeness, i.e. the Tafelwein and QbA categories. Though little known in the United States, the QbA wines can be good value for the money. Non-German European. The Austrian: 2007 Riesling vom Urgestein, Qualitätswein, Winzerhof Stift in Roeschitz was judged best wine in this category. The Austrian classification of wine is similar to that of Germany, with two major differences. The enrichment of wine through suessreserve, a major component of German winemaking, is illegal in Austria. When wines are sweet, this reflects noble rot, frost during the harvest, arresting the fermentation and sun drying. The latter is common in Austria, while it is illegal in Germany. New World. All of the winners in this category were from the United States. The first prize went to the 2007 Chateau Ste Michelle dry Riesling from Washington State. Winemaking of Chateau Ste. Michelle, as far as Riesling is concerned, is influenced by the famous Weingut Dr. Loosen from the Mosel region. Indeed, Chateau Ste Michelle and Dr. Loosen, in a joint venture, produce a wine called Eroica (with the name being taken from the famous van Beethoven symphony), which is an off-dry Riesling (with more than 20 grams remaining sugar per liter). But this delicious example of successful New and Old World cooperation did not enter the competition. Three silver medals were also award. One medal went to another wine of Chateau Ste Michelle: 2006 Late harvest Riesling Ethos. This is a sweet wine with 220 grams of sugar per liter and a low alcohol level (8 percent). If it were a German wine I would think the fermentation had been arrested, given the low level of alcohol, but winemakers in the United States have more sophisticated technologies at their disposal. The second silver medal went to the: 2007 Jana Michigan Riesling. This is a wine from Michigan, produced by California wine maker Scott Harvey. He is based in California and produces wine under various labels, mostly from Napa valley and Amador county. Finally, a third medal went to the New York Finger Lakes wine: 2006 Riesling dry from the White Springs Winery. This is evidently an area with strong German/Austrian/Swiss roots that produces excellent Rieslings. This one is a dry one. If you have a favorite Riesling, I would be delighted to hear from you. This is a slightly revised version of an article that has been posted on the website of the International Wine Review in August 2008. Irouleguy is a tiny wine region in the Basque country in the South West of France, virtually unknown outside of France, but an AC region. The Basque country covers areas both in Spain and France. The Irouleguy is considered to be the wine of the French part of the Basque country and it goes very well with Basque food., which is hearty and a bit spicy. We were in the Basque Country earlier this year and had the Domaine Brana Rouge in a restaurant in St. Jean de at the coast near Biarizze. Tpically, the Irouleguy Rouge have a deep dark colour with a high level of alcohol. These are full bodied wines. As the Brana Rouge opens in the glass, the dried herbs and green peppers meet the nose, followed by a wave of tannin with raspberry aromas. Already then, I was overwhelmed by the wine’s inherently sauvage nature. The winery Etienne Brana exist since 1897 in Saint-Jean-Pied-de-Port in the heart of the Basque country. The primary grape variety is the Tannat, complemented by Cabernet Sauvignon and Cabernet Franc. The Madiran in the Gascony, further up south, is a similar wine with a strong Tannat component. Tannat in Irouleguy and Madiran is what the Malbec is in the near-by Cahors region. It is the dominating grape. At the same time, in the New World, Malbec has become the trademark of Argentina wine. Similarly, the Tannat grape has become the trademark in neigbouring Uruguay. It was introduced by Basque settlers in the 19th century. In the Washington DC area, the wine is being imported by Wine Traditions. In Frankfurt, I had a nice Bearn at Jacques’ winedepot . France's culture de la vigne is as much a product of history as an accident of geography. Since the beginning of winemaking in France, the French climate has been perfect to support a variety of grapes. The best wines in the world are made in France. Now, this is threatened, many wine growers feel, by climate change. In 2003, which was a very hot year, many feel that wines lost their identity and, for example, wines from the Loire valley in the northern part of France tasted like wines from the Rhône in the South. Reflecting these concerns, in August of this year, 50 of France's top chefs, sommeliers and wine producers wrote to Nicolas Sarkozy, the French president, arguing that climate change was threatening the survival of the wine industry and pushing for France to demand a 40 per cent cut in global carbon emissions by 2020 at this December’s Copenhagen conference. Climate change, they wrote, was threatening the soul of French wines. Now, Greenpeace, has presented on September 4 under the heading: Rouge Alert: Climate Change Threatens French Wine a detailed study of the impact of climate change on wine in France. The study details how French wine production is a climatically sensitive endeavour - and shows that it is at great risk from environmental change. The same day, the Financial Times carried an interesting article on the subject. Stuart Pigott (September 2009), Wein Weit Weg – Wine far away: Expeditionen von Norwegen ueber den Kaukasus nach China. It is a book, as Pigott puts it, about the wine regions of the 21st century.... Norway and China? We had dinner with on old Riesling from Hochheim/Rheingau. I still remember vividly when we bought this wine at the end of an amazing wine tasting at the Lauer winery in a dark and damp centuries-old wineceller, during which Mr. Lauer did not stop opening one treasure after the other. With that in my head, we approached the wine with an enormous amount of respect. Of course, it was over-aged with a strong sherry note, but this wine embodied so much for us. Lauer is a typical family-run winery in Hochheim/Rheingau/Germany with 4 hectars of land. The traces of the winery go back to 1621. All the wine the Lauer family produces is sold directly at the winery, either directly as I bought a couple of cases 30 years ago or in the "Gutsausschank Reblaus" a wonderful brasserie which is open from Monday to Friday in the evening all year around.